The Guacamole Hosta is one out of over 70 species commonly grouped under the genus name plantain lily. 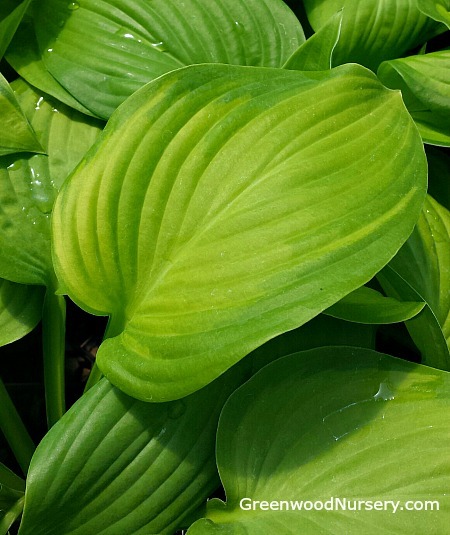 This award winning Hosta is primarily grown for its ornamental foliage. It is named after the color of its leaves which resembles guacamole, an avacado based dip. They are a golden chartreuse, slightly convex with a wide oval shape. The leaf centers change to a lighter gold when exposed to sunlight. Their irregular margins are a dark bluish-green hue. The leaves are glossy on the top and glaucous underneath with distinctive veins. This hosta plant has very fragrant, off white flowers that bloom in mid-summer. They grow on scapes that go up to 36” tall. The Guacamole grows rapidly and is fairly tolerant to sunlight. It is unique in that it fills a niche not many other plants can with its tall flowers and broad coarse leaves. They are very popular in the city because they are hardy plants that can withstand sunlight and air pollutants. Growing up to 22” tall with a 38” spread, this hosta has average water requirements but requires consistent watering and minimal maintenance. It is a plant that will do well in a shady woodland garden. It has many companions that match its color. If you want a vibrant theme, colorful plants like the Heucheras, Astilbe and Dicentra Spectabilis are the perfect contrast to its off-white flowers. The Guacamole Hosta requires moist, well drained soils which are highly organic. The optimum pH is between5.5 and 7.5. Sandy soils are best to provide aeration for the roots. You can plant under filtered sunlight; morning sun is tolerable but hot afternoon sun will be fatal to them. It is easily propagated though division. You can buy hostas online here at Greenwood Nursery. They are ideally grown as a border plant or as a cut flower plant for their fragrance.